The easiest way to get from any airport to the Moscow center is to use Aeroexpress (train to Moscow) service. It costs about 350 roubles (about 9 euro). Trains depart every 30 minutes and it gets about 30-40 minutes to reach one of central railway stations. More information about Aeroexpress can be found on its official website (English). 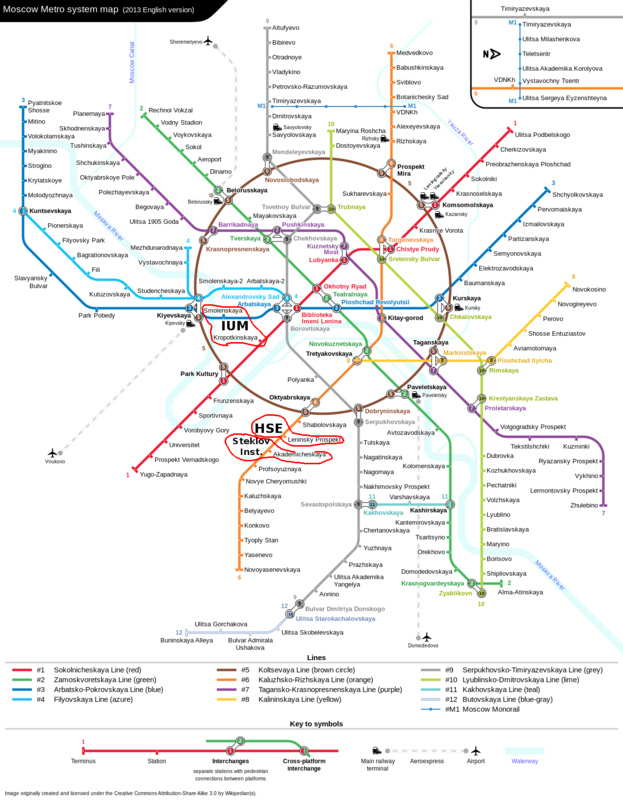 Main transportation system in Moscow is Metro (subway). The entrances to Moscow Metro are labelled with red letter „M”. Here is the scheme with labels for IUM (conference venue, see below), HSE and Steklov institute. (See also scheme without labels.) You can also use interactive route service by Yandex (in Russian). The fare in Metro varies from 40 roubles (1 euro) to 20 roubles (0.5 euro) per pass depending on the number of passes on the ticket. We recommend to by a ticket which contain at least 5 passes. In IUM (conference venue): WiFi Internet connection is available in IUM. Details of the connection will be provided in your conference kit. In the city: there is free WiFi internet connection available in almost all cafes, restaurants and shopping centers. In some cases you need to ask for connection details, but often you can just get first available network with the word "Free" in its name (ESSID) and use it. Note that you have to use encryption (HTTPS) when working with sensitive data (like password, credit card numbers and so on) in openly available WiFi networks. If you need any assistance, please, call our Conference Emergency Number +79661863994 or write via e-mail aflc (at) mccme.ru. The conference will take place at the Independent University of Moscow in the building of Moscow Center of Contiunous Mathematical Education (MCCME) located in the very center of Moscow. Address: 11, Bolschoy Vlas'evskii pereulok. Attention! There are two Smolenskaya stations in Moscow metro — you need the one on a dark blue line, or line №.3, see the scheme; walking distance about 7 minutes, see the route below. Kropotkinskaya on the red line, or line №1, walking distance about 10 minutes). Good place to have a lunch with reasonable prices. Average bill is about 250 roubles (6-7 euro). Address: 8, Gubkina, 2nd floor. Another way to get there is to get out of Leninsky prospect metro station (exit to Ulitsa Ordzhonikidze/Улица Орджоникидзе), cross Leninsky prospect and catch any public transport which follows to "Univermag Moskva" stop. Then cross Leninsky prospect again. Attention! Please, note that the building is closed after 11pm. So you have to return to the guesthouse before 11pm. Address: 5, Dmitiya Ulyanova street, (ул. Дмитрия Ульянова, 5), average bill: 800-1000 rub. (about 20-25 euro). Address: 5a, Dmitiya Ulyanova street, (ул. Дмитрия Ульянова, 5а), average bill: 1000 rub (about 25 euro). Visiting Moscow: an advice for international visitors. This page was last modified on 12 January 2014, at 07:47.